This entry was posted on Saturday, January 31st, 2009 at 11:07 PM	and is filed under Ancient. You can follow any responses to this entry through the RSS 2.0 feed. You can skip to the end and leave a response. Pinging is currently not allowed. As for low sperm count… well, we all know how being unable to reproduce has ALWAYS been blamed on the man with low sperm… No, it isn’t? Well color me embarrassed! Nah, I’ll tell you how it was. Utzi was totally shtupping the chieftain’s wife. Caught *in flagrante delicto* he managed to fight off the rather upset chief long enough to grab his gear and head for the hills. The chief and his band of sworn brothers gave chase, caught and killed the misfortunate Utzi and left him and his stuff because all they were after was their chief’s honor, which they regained. If this archaeology thing doesn’t work out, I may take up writing bad historical novels. Ya rly. I hadn’t even thought of that — I blame v1@gr@ spam — but of course they would have shunned the barren wombs rather than blamed low sperm count. I think your idea makes as much or more sense than any of the others. Clearly, you have at least one roman a clef in you. Write! Write! Write! The low sperm thing is really dodgy, I agree. The weapons point is a fair one, though, on the assumption that weapons were valuable, hard to make, etc. Why just leave them there? I’m not even sure how the researchers know the weapons are distinctive. 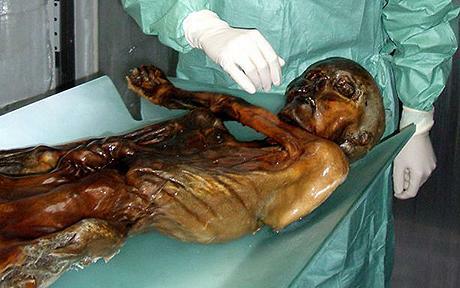 I don’t think we have tons of material surviving from the period, hence the amazingness of Otzi. General theoretical grounds? I’m thinking something like this: weapons would be handmade, and not in a very mass-produced way; so there would be distinguishing features about them — at a minimum, sufficient for the owner to recognize his own! — and in smallish populations in which weapons were relatively specialized and prized objects, and there’s not a whole lot to do except compare hatchets by the time February rolled around each year and all the dried berries were eaten and every fart joke had been told a dozen times that winter, everyone else would therefore be able to recognize them easily, too. Where I grew up, I could recognize practically everyone’s car or (usually) truck at a glance — that’s a population of a few hundred. Would handmade weapons be less distinctive than Detroit half-tons? Anyhow, I’m more confident that some explanation is called for than that the explanation they offer is the right one. But I also don’t think it’s particularly implausible. That makes sense. Especially the bit about fart jokes. thanks for sharing such an wonderful post.